One of the most unique aspects of fenugreek is that, is a very useful herb in any form – powdered, seeds, dried leaves and as a vegetable. Apart from being used in methi paratha (fresh leaves) or as a spice (kasuri methi), fenugreek leaves also have many cosmetic and health purposes. Anti blemish: Fenugreek can be used to get rid of dark spots and blemishes caused due to acne. Take a quarter cup of fenugreek seeds and boil them for 5 minutes. Now let the seeds soak in the water overnight. Next day, remove the seeds from the water and grind them into a thick paste. Apply this paste, evenly, on your face and wash it off with water after 15 minutes. Anti Acne: The antifungal and antibacterial properties of fenugreek, help to keep the facial skin pores germ-free. Moisturizes the skin: Some researches also show that applying fenugreek paste helps to smoothen or soften the skin by removing dry and dead skin flakes. Anti aging: It is also believed that making fenugreek paste along with a tablespoon of curd can prove to be effective to keep your skin wrinkle-free, to a certain extent. The paste should be used once in 5 days. 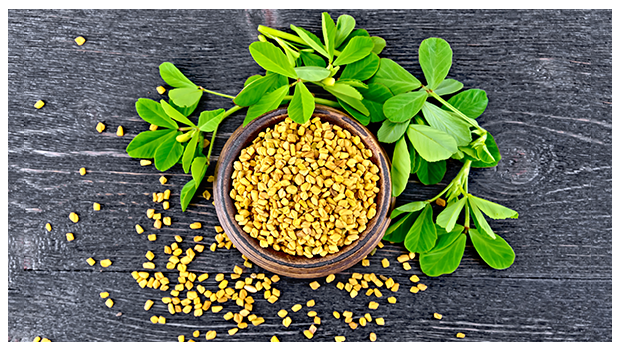 Reduces dandruff: The antifungal and moisturizing properties of fenugreek helps to lessen the dryness of the scalp. Again, a concoction of fenugreek paste with curd is to be used. Twice a week apply this mask on your head for about 20 to 30 minutes and wash it off with a shampoo. Promotes healthy hair growth: Boil bowl of coconut oil with a handful of fenugreek seeds till the seeds slightly change their colour. After the oil cools down, strain the mixture and massage your scalp with the oil at least an hour before your head-bath. Use the oil twice a week to reduce hair fall. Adds shine: for glossy hair, just soak fenugreek seeds in lukewarm water for a night. Then make a paste of the seeds and apply it on your hair, till the roots, like a hair mask. Wash it off after 30 to 40 minutes and say hello to your shiny tresses. Paste of fresh fenugreek leaves too can be used. Prevent and control diabetes by regulating the absorption of sugar by the body. Aid weight loss by facilitating digestion and bowel movement. To get the maximum benefits of fenugreek leaves or seeds, it’s recommended to opt for their organic versions as they are free from any harmful pesticides and chemicals. Visit 24 Mantra Organic for the best of organic foods.